According to the anti-vaccine religion, the central story is that the CDC admitted that 98 million Americans received the polio vaccine during an 8-year span when it was contaminated with a cancer virus. Other websites essentially repeat the same nonsense. And it’s in the lyrics of a rap song (seriously, the stuff people send me continues to amaze). If Mihalovic were a vaccine researcher, wouldn’t he have a robust list of peer-reviewed articles with his name attached? Well, he has published exactly zero PubMed-indexed articles about vaccines. He actually hasn’t published anything about any medical science anywhere. His claim to being a vaccine researcher rings rather hollow. What Mihalovic probably means is his research included a few hours on Google and thinks he’s now as smart as anyone who actually has a bachelor’s and doctoral degree in immunology, virology, biochemistry, epidemiology, or some other biomedical science that matters to real vaccine research. Of course, a real “vaccine researcher” has a decade or two or three of real scientific research in a real world class laboratory. Mihalovic is as much a vaccine researcher as I am an Oscar-winning screenwriter. Please note that I am not a screenwriter, let alone an Oscar-winning one. However, I could say that I write screenplays. I could claim that I am Steven Spielberg’s best buddy. But it would take you about 47 nanoseconds to find that there is no evidence of my being a screenwriter. Or that I am friends with Spielberg. So are you now scared? If you are older than 50, according to Mihalovic and others in the anti-vaccine religion, including one wannabe rapper, you are carrying a virus that will give you some cancer. And this anti-vaccine zombie trope keeps coming back to life, making it even scarier. As I said, responding to the myth of “polio vaccine causes cancer” takes much more time. As a scientific skeptic, with, I hope, above-average critical thinking skills, I can smash the myth into tiny little pieces. The fact is that of the three parts of the myth mentioned in the previous section, only the first one is partially true, and the rest are complete nonsense. None are supported by real scientific or historical evidence. But like most pseudoscience, they are based on some tiny piece of science and eventually over-exaggerated with logical fallacies, misleading terminology, and outright untruths. Jonas Salk, the hero of the war against preventable diseases. 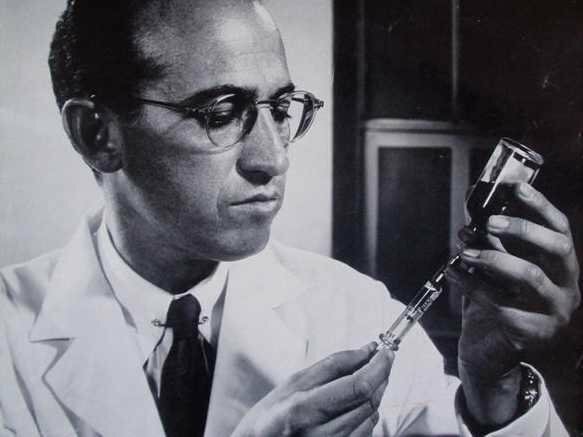 The groundbreaking and lifesaving polio vaccines developed separately by Jonas Salk (injected, inactivated virus, vaccine) and Albert Sabin (oral, live virus, vaccine), have been used since the 1950s. 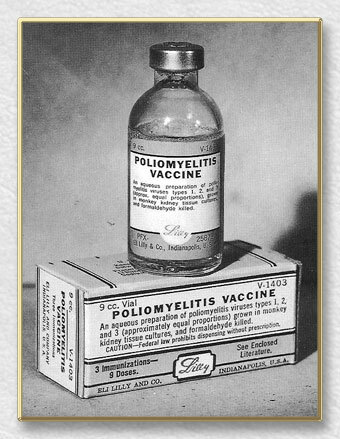 Immunization against polio went back and forth between the two versions of the vaccine, although since the early 1980’s, the USA uses the Salk version of the vaccine almost exclusively. The vaccines were developed in the early 1950’s and were produced using VERO green monkey kidney cell lines. Typically, viruses used in vaccines need to be “grown” in a cell line, because viruses cannot replicate themselves without hijacking a normal cell, and reproduce using that cell’s machinery. I know that the anti-vaccine religion thinks that viruses are grown magically, and you can just grab a handful of them, throw them in a blender with a dash of mercury, aborted babies, and aluminum – voila, you have a vaccine. Sorry, it’s not that easy. In 1959, microbiologist Maurice Hilleman found a monkey virus in both vaccines — it was the 40th simian virus (SV) to be discovered by scientists, so it was given the moniker of SV40 (creativity in naming viruses isn’t important even today). Back in the 1950’s, we didn’t have the technology that we do now to screen for contaminants in the growth medium, so the SV40 virus had contaminated the VERO line well before the beginning of production of vaccines. Not all of the VERO cells in culture were contaminated, although the exact proportion is unknown. Salk’s inactivated virus vaccine, which was treated with formaldehyde (only a tiny amount remains in the vaccine, and let’s not spend time arguing about “danger” of formaldehyde in vaccines), had very small amounts or possibly none of the SV40 virus. On the other hand, Sabin’s live oral vaccine was heavily contaminated with SV40, because there was no treatment made to the vaccine to inactivate the polio virus. Worried about the potential effects the virus could have on humans, researchers injected it into hamsters, finding that nearly all of them developed massive cancerous tumors. But, as I’ve said on numerous occasions, primary research should be examined carefully before accepting that it has any type of applicability to human health. And causing cancer in rodents does not necessarily have clinical significance for humans. Upon further review of the initial studies, it was observed hamsters that ingested SV40, instead of being injected with it, didn’t develop any cancers. In other words, Sabin’s live oral vaccine (which actually had a higher burden of SV40 than the injected, inactivated virus Salk vaccine) could not cause any cancer. Additional studies showed that children who were given Sabin’s vaccine did not develop antibodies to SV40; apparently, the virus quickly and safely passed through the child’s digestive system, never causing an SV40 infection. On the other hand, Salk’s vaccine, which contained very little or no SV40, but was given by injection, there was evidence that some of these children might have been infected with SV40. Furthermore, recent studies have shown no credible evidence (here, here, here and here) that those children who received SV40 contaminated vaccines had an increased incidence of cancer versus unvaccinated children. No plausible evidence suggests that SV40 has ever caused cancer in humans (pdf). A meta-review of published research from the 1960’s to 2004 showed no evidence that supported any causal link between SV40 and any cancer. A review of cancers thought to be most associated with SV40 found no evidence to support causality between the virus and cancer. So even if SV40 entered into the bodies of individuals who received the polio vaccine, there is little evidence supporting a causal link between the virus and any cancer. I don’t know how many bullet points I need to make, but unless someone wants to deny history, basic science, and mountains of data accumulated over the past few decades, one simply cannot make a valid claim that the polio vaccine currently or has ever caused a single case of “cancer.” I will admit that it is biologically plausible that contaminated polio vaccine could cause cancer – however, subsequent research and the vast wealth of evidence states that it is unlikely, if not impossible, that there was any link. Predictably, the information spread by the “polio causes cancer” articles pushed by the anti-vaccine religion is wrong on so many levels. We know that not all polio vaccines were contaminated. We know the SV40 virus in the oral vaccine merely passed through the digestive tract without infecting any cells (the first step for SV40 to actually cause cancer). We also know, as established by numerous peer-reviewed articles, that SV40 probably does not cause any kind of cancer in humans. Even if a tiny percentage of individuals who contract SV40 that leads to cancer, it’s at such a low rate that it would be impossible to detect unless we check tens of millions of patients. Lastly, and most importantly, the claim that “98 million” might catch cancer from the polio vaccine sounds like an incredibly scary story. The number is ultimately inaccurate, a tactic employed the anti-vaccine religion whenever it suits their needs to establish dangers of vaccines. In other words, facts be damned, let’s say whatever sounds truly spine-chilling. The real scientific facts are before the SV40 virus was removed from the vaccine, around 98 million children got one of the two forms of the polio vaccine. However, eliminating those who got the oral vaccine, which, as we have established, did not infect children with the SV40 virus, approximately 10-30 million Americans were immunized with the Salk vaccine that probably didn’t contain the SV40 virus. Finally, even if all of these children were infected with SV40, there is little evidence that establishes causality for cancer. The SV40 virus contaminated some polio vaccine cultures. Not all polio vaccines from the 1950’s through 1963 were contaminated by the SV40 virus. Those who took the oral vaccine just passed the SV40 virus through their digestive tract. Certainly, not 98 million children were infected with SV40. SV40 was eliminated from polio vaccine production after 1963, so the SV40 risk is 0. SV40 is associated with lots of cancers, but there is no evidence that it causes cancer. None. Let’s remember the most important point–polio vaccines have saved and will save many many lives. And we have irrefutable evidence for it. The problem with these alternative facts from the antivaccination cult is that if you just looked at the headlines for those articles, you’re probably terribly concerned that giving the polio vaccine to your children puts them at risk of cancers. Or that somehow worse information about vaccines is being suppressed by the CDC, FDA, and Illuminati. But the facts are that the CDC and FDA have been transparent about this story for 50 years, and have invested substantial sums of money into researching it. And that research has found nothing there. When raising children, we’re all terribly concerned about how to protect them. I’m sure that most parents would be happiest if we could cover our children in bubble wrap with a satellite tracker and air purifier installed. As a father of three daughters, I also wish I could hire Navy SEALS to protect them 24 hours a day. But of all the things that cause parents to worry, polio vaccines are not one of them. Because if you could take a time machine to the early 1950’s, you’d have real worries – devastating polio epidemics that randomly chose towns and villages to attack every summer. Editor’s note: This article was originally published way back in August 2014. It has been revised for updating, copyediting, fixing broken links, cleaning up formatting issues, and giving it a new coat of paint. Also, it’s important to refresh and push out this article every time the zombie trope comes back to life. Carbone M, Pass HI, Miele L, Bocchetta M. New developments about the association of SV40 with human mesothelioma. Oncogene. 2003 Aug 11;22(33):5173-80. Review. PubMed PMID: 12910254. Dang-Tan T, Mahmud SM, Puntoni R, Franco EL. Polio vaccines, Simian Virus 40, and human cancer: the epidemiologic evidence for a causal association. Oncogene. 2004 Aug 23;23(38):6535-40. Review. PubMed PMID: 15322523. Engels EA, Katki HA, Nielsen NM, Winther JF, Hjalgrim H, Gjerris F, Rosenberg PS, Frisch M. Cancer incidence in Denmark following exposure to poliovirus vaccine contaminated with simian virus 40.J Natl Cancer Inst. 2003 Apr 2;95(7):532-9. PubMed PMID: 12671021. Kimman TG, Boot H. The polio eradication effort has been a great success–let’s finish it and replace it with something even better. Lancet Infect Dis. 2006 Oct;6(10):675-8. PubMed PMID: 17008176.